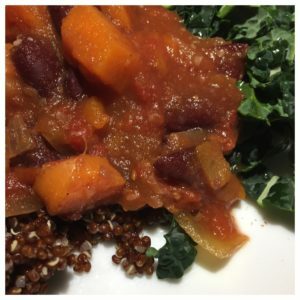 This warming, vegetable stew started when I found some turnips ready in the garden, but you could use different combinations and quantities depending what you like and what you have. Apart from washing and chopping the vegetables, I left the rest to the slow cooker and came home to a delicious dinner. I make my own chili powder so you may need to adjust your quantity depending on how hot yours is and how hot you like your food. Serve over rice or baked potatoes or quinoa. *to make ¼ cup chilli powder mix together 2 tbsp paprika, 2 tsp dried oregano, 1 tsp each of ground cumin, garlic powder, cayenne and onion powder. Taste and season with salt as required. Depends on how salty your tomatoes and tomato paste are.